In decades past, hosts could pretty much guarantee that there would be smokers openly smoking cigarettes at their dinner parties and cocktail parties. In fact, it was not that long ago that cigarette servingware was a thing. Smoking cigarettes was so popular that you actually set them out for your guests in the same way you would set out plates of hors d’oeuvres. Of course, those days are long past and smoking rates in the United States are steadily dropping. Now, most parties are just assumed to be non-smoking soirees, and you will likely have more non-smokers than smokers at your gatherings. 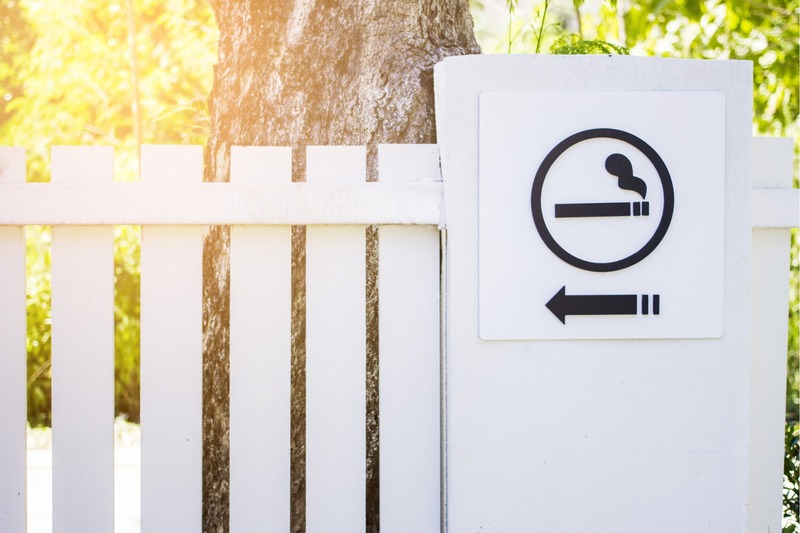 Folks are increasingly aware of the health risks related to first- and secondhand smoke, and many people (even former smokers) now want to be as far away from smokers as possible. 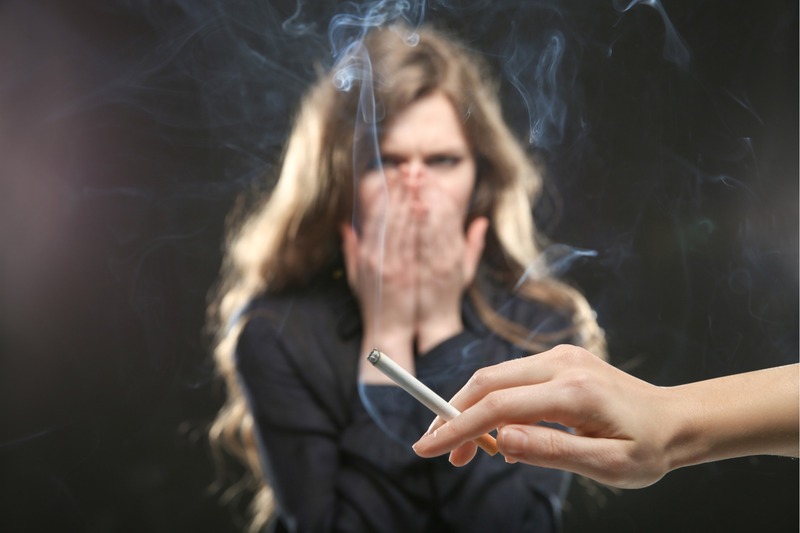 Now that smoking is becoming somewhat of a taboo, most guests who are smokers in their daily lives will not light up at your party without asking, especially if there are children in attendance or if there is a mixed crowd with people they do not know. However, if you live with a smoker or have smokers in your close circle of friends who are used to being allowed to smoke at your house, they may not be as willing to go a full night without smoking. And, if you happen to be a smoker, you may not like the idea of having to sneak off to steal a few puffs with no one noticing. Even folks who are not dedicated smokers sometimes smoke when cocktails are involved and, of course, now we also have to contend with a growing number of guests who vape. While the jury is still out about whether or not vaping is truly better than smoking for the vaper or those around them, you are bound to have non-vaping guests who are not interested in being around folks who are vaping. So, if your guest list includes both smokers and non-smokers, what is a host to do? One option is to make it a non-smoking affair and tell your smokers and vapers that they will need to go to their cars or to your front yard if they need to get their fix. If you want to accommodate these guests closer to the party and make it possible for smokers and non-smokers to mingle, your other option is setting up a smoking area. Smokers and vapers are used to being banished to dark corners and the least appealing areas on the sides of buildings, on cramped smoking patios behind bars or huddling under eaves trying to avoid the rain. They are used to having to leave the fun to get their fix and often feel isolated from other guests. Some folks would say this is a good thing and will continue to dissuade folks from picking up or maintaining this habit, but if you want your smokers to feel just as welcome as your other guests, you can do so by creating a comfortable, welcoming smoking area that will not leave them feeling isolated or banished from the party. One of the first things to know is that smokers are well versed in smoking area etiquette so, if you build it, they really will come. Most smokers and vapers have no problem stepping away from non-smoking guests to grab a few puffs and will be happy to comply with your request for them to relegate their activities to a specific area. Also, since they are so used to being banished to the above-mentioned dark corners, they are pretty easy to please when a host chooses to make a little effort to keep their smokers comfortable not too far away from the party. 1. Let smokers and vapers know that there will be a smoking area before they arrive at the party. This will avoid uncomfortable situations and potential embarrassment if they light up and are then singled out and told to move away from the other guests. 2. Also let your non-smokers know that there will be a backyard smoking area at the party. Because so many people are now used to non-smoking social gatherings, they may assume that there will not be smoking or vaping during the party. It is particularly important that you inform anyone who has asthma or allergies or who might bring their children. 3. Look for an area that is well away from the main party space but that is in eyesight and earshot of the fun. This will help keep your smokers from being isolated and will allow your non-smoking guests to mingle with or near the smokers, if they so choose. 4. Choose an area that is not near the entrance, food table, bar or other areas where non-smoking guests will need to go or pass through during the party. 5. Be considerate of any nearby neighbors when selecting your smoking area. 6. Make sure your smoking area is a safe distance from wood piles and objects that could burn, melt or be damaged, such as barbecue grill covers, spa and pool covers, patio cushions and curtains, or artificial grass. 7. Make sure your smoking area is on gravel, bare dirt, or a patio or walkway made from paving stones, concrete or bricks. You want to avoid having smokers on ground covers that may be flammable or could be damaged, such as wood chips, living ground covers, a wood deck or synthetic turf. 8. Provide your smoking and vaping guests with protection from the elements, such as sun or rain, by locating your smoking area on a covered patio or under a canopy. Simple, inexpensive canopies that are easy to set up and put away make good temporary options for this purpose. 9. Make sure that your smoking area and the path leading to it are well lit. 10. Provide simple seating for your guests. You do not want to encourage your guests to hang out in the smoking area all night, but you do want them to be comfortable and be able to enjoy getting to know your other guests while they are there. A few chairs or small benches will do just fine. 11. Make sure you have one or more ashtrays readily available and easy to find. You do not want your guests tossing their cigarette butts in your flowerbeds, so make sure they can easily see and access the receptacles you have provided for ashes and cigarette butts. 12. Consider making a sign that lets folks know it is a smoking area. 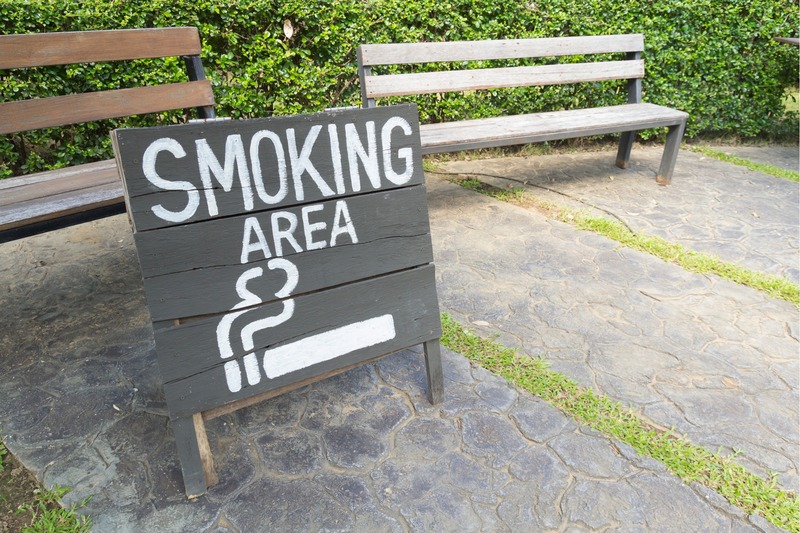 This will help your smokers find their spot and help your non-smokers know where to avoid. 13. If your backyard smoking area is not quite as far from the party as you would like, consider setting up a fan to gently help blow the smoke away from your main outdoor entertaining spaces.